Back in 1943, genius chef Joe Sheridan invented the best way ever to greet weary travelers at Foynes terminal building in Ireland: a hot coffee spiked with Irish whiskey and topped with whipped cream. Because come on, plain tea or coffee just wasn’t going to beat the chill. Cut to today, when the hot cocktail has become a St. Patrick’s Day staple as well as a favorite to cozy up with on cold evenings (or hungover mornings). In celebration of the upcoming alco-holiday, instead of the usual roundup of bar happenings, I thought I’d track down some of the best Irish coffees around town with which to celebrate the luck of the Irish. Note, none of these employ Bailey’s or canned whipped cream. Everyone’s favorite Irish pub Tom Bergin’s Tavern didn’t get to celebrate St. Patrick’s Day last year since it was still in the midst of its remodel. So this year it’s making up for lost time by throwing a “St. Patrick’s-a-palooza” (6 a.m. to 2 a.m.) with all-day Irish breakfast, four flowing taps of Guinness and O’Hara’s stouts, and a race to sell 1,000 Irish coffees in a day. The bar wanted to set a world record for serving the most Irish coffees in 24 hours, but didn’t petition the Guinness committee in time. So instead it set a personal goal of 1,000, and will try for the record next year. The Irish coffees won’t even be pre-batched for the day—they’ll be made to order—but to streamline the process none of the other specialty cocktails, like the iced Irish coffee Sheridan Special, will be available. By the by, whoever purchases the 1,000th Irish coffee will win a shamrock party! The Irish Coffee ($12) at downtown L.A.’s Seven Grand sticks to Joe Sheridan’s traditional recipe but uses organic French Roast, brown sugar, Powers Irish Whiskey (what Joe used) and hand-whipped cream. Lucky for you Sundays are barman Matthew Biancaniello’s nights at Bar | Kitchen Downtown. His crazy craft version of the coffee cocktail is a Jameson candy cap mushroom float with coffee-infused whiskey. But if you want a preview of his candy cap mushroom bourbon ice cream, stop by at Scoops Westside on Saturday when Matt does his second ice-cream pop-up. For St. Paddy’s Day, 1886 Bar at the Raymond in Pasadena will be serving up three cocktail specials at $10 each: the “Irish Maid” (Jameson, mint, cucumbers, simple, lime), “Smoking Jacket” (Redbreast 12 Year, tobacco bitters, maplewood smoke, orange vanilla ash); and an Irish Coffee (Jameson, simple, brown sugar, hot coffee, layer of cream). At Jax Bar & Grille in Glendale, barman Ken Baranda presents “The Feral Irishman” ($10), a twist on the classic, made with Redbreast, demerara sugar, Xocolate bitters, Elemakule tiki bitters, hot coffee, topped with hand-whipped cream and nutmeg. 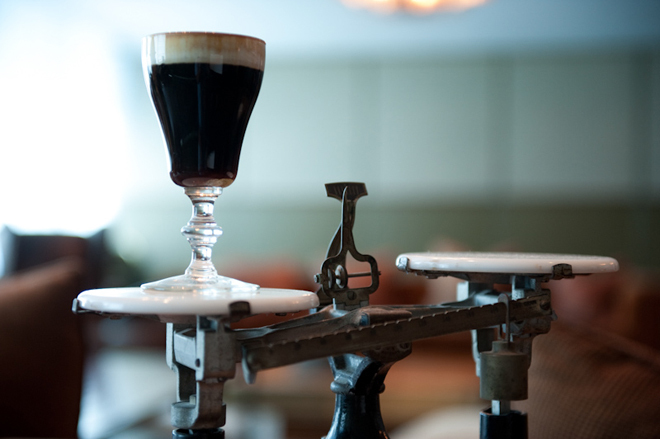 Chateau Marmont’s Lobby Bar is proud of its strong Irish coffee. “We don’t water it down with too much coffee,” says barman Matthew Schaefer. Theirs is made with brown turbinado sugar, Redbreast 12, Intelligentsia coffee, and topped with a heavy cream float. Also in Glendale, The Famous has a cold-brewed Irish coffee with Tullamore Dew and toasted pecan whipped cream. While you’re there check out the drink specials like $5 Tullamore Dew shots, Guinness and Ben Franklin’s milk punch, as well as $6 “Thit Se Ar An Urlar” (Gaelic for “He Fell on the Floor”) with Green Chartreuse, Aperol, Breckinridge bitter liqueur, and Tullamore Dew. Public Kitchen & Bar in the Hollywood Roosevelt Hotel will offer an Irish Coffee ($12) made with LAMILL coffee, Tullamore Dew and whipped cream. Culver City’s Bigfoot West has a beery variation with its “McKinley’s Delight” ($10), which is made with Tullamore Dew Irish whiskey, oatmeal stout, topped with whipped cream. 320 Main in Seal Beach is doing a cold-pressed Irish coffee. “When you cold brew coffee you leave the bitterness and acidity of hot brewed coffee behind and end up with a smoother product that showcases the beans’ more round chocolate and fruity notes,” says bar owner Jason Schiffer. His cocktail will feature Portola coffee, Redbreast 12 Year, and hand-whipped cream.